Sun sets behind Cape Cod (Highland) Lighthouse in Masssachusetts. The ocean waters in New England remain quite cold during the spring months from the cold Atlantic currents until late May when they finally begin to warm up. The keeper of any lighthouse must maintain the light to guide mariners in all types of New England weather. One of the difficult aspects of any keeper’s job, especially when involved in any rescue attempt, is that they must make a decision in extremely risky situations as to the amount of risk they must put their lives through to save those that are in distress off shore. It is also equally as difficult for local mariners to observe those in distress without trying to help. It is in our human nature to help those in need, sometimes at the point of possibly risking our own lives. Enoch Hamilton became keeper at Cape Cod Light in 1850. 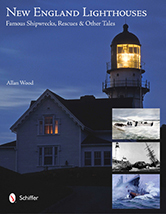 The worst wreck recorded at Highland Light occurred during Keeper Hamilton’s tenure. 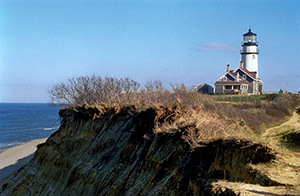 During a violent afternoon storm shrouded in heavy fog on April 20, 1852, the British vessel Josephus, (referred to also as the Josepha), with a cargo of iron rails, skins, and white lead, struck a dangerous outer sandbar of the Peaked Hill Bars, about a mile from Cape Cod lighthouse, and a half-mile from the beach nearby. The ship broke apart with its heavy cargo spilling most of the crew into the freezing winter waters. 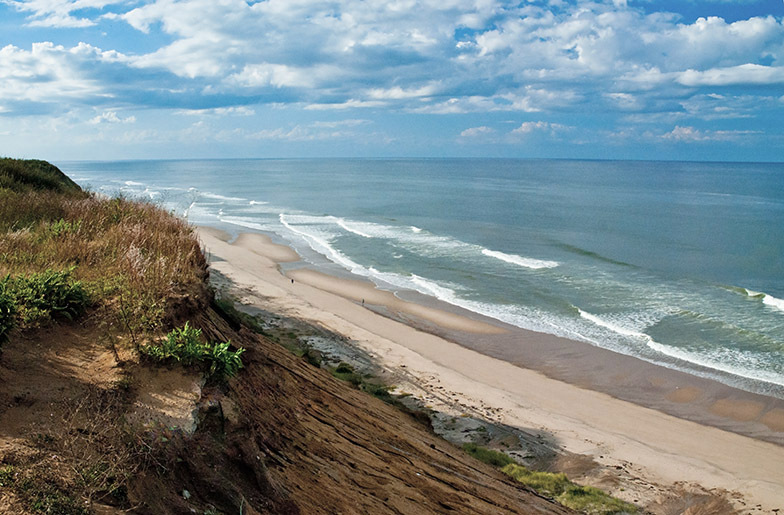 Cape Cod beach below cliffs by lighthouse. The keeper dragged a lighthouse dory down to the beach, but the seas and high winds were too dangerous so Keeper Hamilton decided to make the heart wrenching decision to remain ashore and not to risk any of his crew. Many of the townsfolk came to the beach and could hear the cries of the victims from the wreck. By 7 o’clock that evening, the screams for help from the ill-fated vessel were too much for local fisherman Jonathan Collins to bear. He persuaded Keeper Hamilton into using the lighthouse dory, and against the pleas of Hamilton and his own neighbors, started to drag the dory towards the beach. Daniel Cassity joined his friend as they set off for the wreck. As the boat cam close to the wreck, a huge wave washed over the boat, capsizing the craft into freezing waters. Many watched in anguish as they witnessed their neighbors perish under the waves. As the screams from the wreck subsided and the night wore on, fires were lit on shore for any survivors. At around 11 o’clock, Hamilton and a companion were walking along the shoreline and were shocked to find one of the crewmembers of the Josepha, George Chitney, kneeling before one of the fires. Exhausted, badly bruised and frozen, he told them he and a fellow crewmember John Jasper, whom he believed was dying, were clinging to pieces of timber from the wreck and felt both were being carried ashore. They found Jasper only a short distance away in bad shape from hypothermia, but alive. Cape Cod Lighthouse before it was moved back. As the night progressed into the following day, only six bodies were recovered of the 16 crewmembers. The body of young Daniel Cassity was found and given a proper burial in Truro. At the lighthouse, the physician was called in early in the morning and found survivor John Jasper in a high fever, with his hands and feet still very swollen. The two men who miraculously survived the wreck, stayed at the lighthouse for a couple of days until they were well enough to be moved to the local hospital. Both men survived the ordeal. Years afterward, one of the survivors of the Josephus, John Jasper, later became the captain of a trans-Atlantic ocean liner. When his vessel passed Cape Cod (Highland) Light and Keeper Hamilton, he would dip the flag as a signal of respect to Keeper Hamilton for helping to save his life and sound the horn to memorialize has fellow comrades whom had perished. 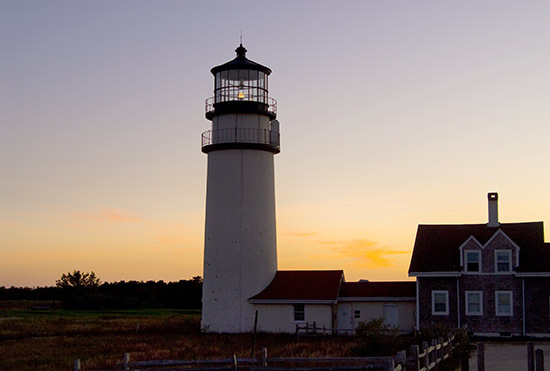 For more information on Cape Cod (Highland) Lighthouse and attractions nearby Click Here.